Explore D.C.: Extra! Extra! Check out the Newseum! ~ Learn, Live, and Explore! Explore D.C.: Extra! Extra! Check out the Newseum! Now that I've lived in Washington DC for 10 years, when my parents visit, I am forced to become more creative to find new and interesting things for them to do or see. I lucked out this round because Groupon came out with a discount admission to the Newseum - a museum in DC dedicated to chronicling: the role of journalism in history; the continually expanding reach of news outlets through technological advancement and elimination of international barriers and restrictions; and, the addition of new media to improve delivery speed, level of impact, and volume of reports available from all points of view. OK, that description just bored me as I reread it, but trust me, the Newseum is quite interesting and memorable. 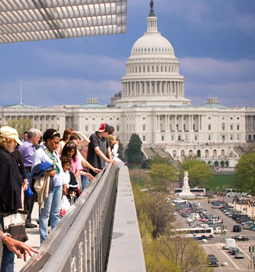 Rated in the Top 5 of Recommended Attractions in Washington, DC, the Newseum is popular for tourists and student groups alike. Personally, I find the regular adult admission of $21.95 for a 2-day (consecutive) pass to be a bit steep, so the only two times I've visited have been with a Groupon, lowering the entry to fee to $10 - much better! Once you get through the entry process, either find the local elevator or head down one floor to catch the express elevator to the 6th Floor. You're going to start your tour at the top because the floorplan showcases the downward spiral design of the museum, with ramps and stairs leading you logically through the exhibits. My #1 Favorite: 6th Floor Pennsylvania Avenue Terrace - go outside and get some fantastic photos with the U.S. Capitol in the background and read about the history of Pennsylvania Avenue below, most notably the protests and marches and, of course, as the one mile Presidential Inauguration parade route to the White House. 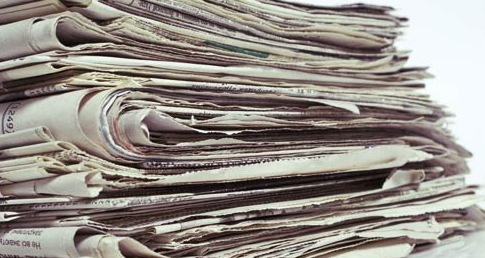 My #2 Favorite: News Corporation News History Gallery - Spend most of your time here at this collection of newspapers. The design of this permanent exhibit is spectacular. Travel down one side and back up the other of this row of temperature-controlled, soft close glass drawer stacks - presented in chronological order, with the most famous headlines appearing in the top box. Wars, assassinations, monumental events, tragedies, triumphs, etc. are all represented. You will find yourself oscillating between thinking "Oh I know about that!" and "Oh that's so neat, I never knew that!" at every stop. 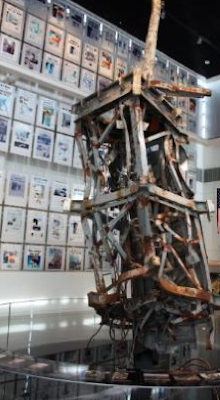 My Favorite #3: 9/11 Exhibit - reprinted front pages from around the world, unforgettable and horrifically tragic photographs documenting the day's events, and a few artifacts, including part of the North Tower's antenna. While this exhibit is small, it packs a big punch. If you're short on time, I recommend fitting these three stops into your visit, then choose other exhibits based on your preferences. For kids, the interactive newsroom looks fun. One area to skip, if you're short on time, is the 4-D movie. True, it is only 15 minutes, once you get into the theater, but the movie is mediocre. It highlights three journalists: Isaiah Thomas, a patriot and publisher of the pro-independence Massachusetts Spy newspaper before and during the Revolutionary War; Nellie Bly and the introduction of detective journalism, as she conspired to get herself committed for 10 days to a notorious womens' mental institution to expose the poor living conditions and treatment of patients; and Edward R. Murrow's effort to get permission to be the first journalist to broadcast live, over the radio during the height of the London Blitz. While the main attraction of the theater is the moving seats and other special effects to create that 4th dimension, overall, the addition of both the 3rd and the 4th dimension elements did nothing to made it more than just a gimmicky experience. But that is just my opinion! 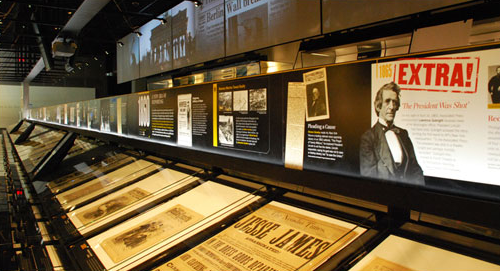 So, if you're looking for something to do in DC that is off the "beaten path" of memorials and Smithsonians, check out the Newseum, conveniently located by the National Archives and the Smithsonian Art Museums.